Happy Fourth of July weekend to you! I have a great recipe for you today. 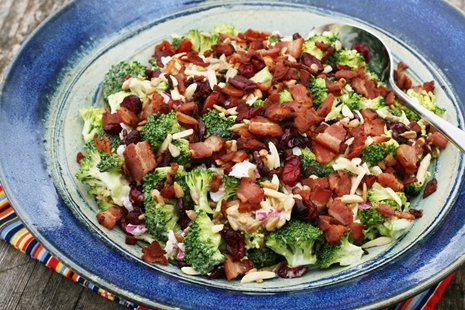 I am a huge fan of broccoli salads and I came up with my own variation using LOTS of bacon! I also added other elements of different textures and flavors.. savory, sweet, crunchy, chewy, and best of all – delicious! If you’re still wondering what to bring to your holiday potluck party, this is very simple to prepare and has that nostalgic flare everyone loves. It’s old school made new. Enjoy! ½ – 1 cup crumbled bacon (approx. 6 to 8 slices for 1/2 cup and 12-16 slices for 1 cup) * I like mine with lots of bacon! **If your local grocery store sells ingredients in a bulk bin, what I like to do is buy just what I need for 1 recipe. It’s often cheaper and you have no waste afterwords. Bulk bins are great for dried cranberries, nuts, sunflower seeds, etc. Most butcher cases also sell thick-quality bacon in bulk. Just tell them what you need! 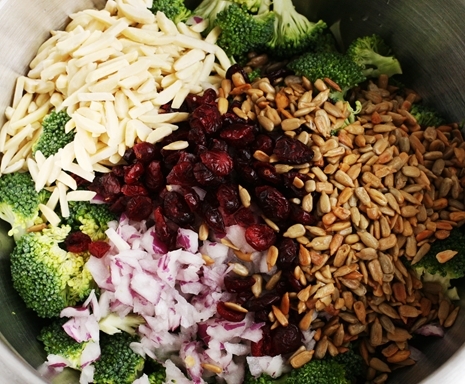 Add broccoli, red onions, cranberries, almonds and sunflower seeds to a large bowl. Next, make the dressing by mixing mayonnaise, vinegar, sugar, and pepper in a small bowl. Pour dressing over the broccoli salad and mix thoroughly. Transfer salad to a large plate or serving bowl. 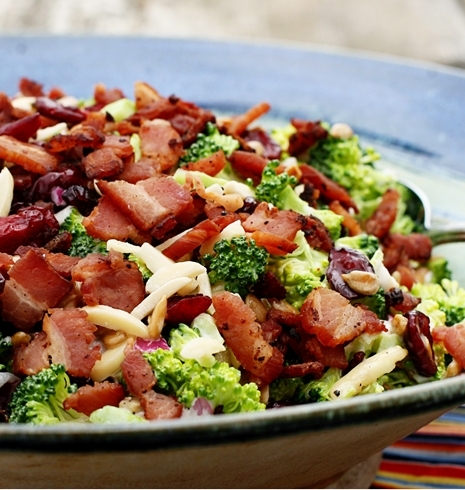 Finish the salad off by garnishing with the crumbled bacon. If you prefer a bacon free version, omit bacon and garnish with ¼ of cranberries and ¼ of slivered almonds. Enjoy! 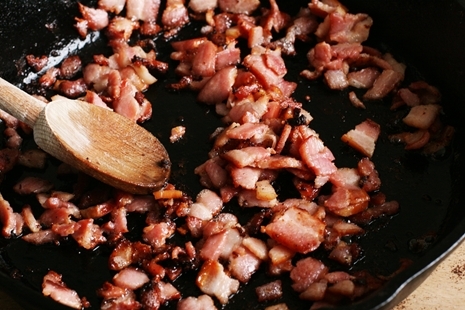 *Good quality bacon makes the best crumbled bacon bits, ever. 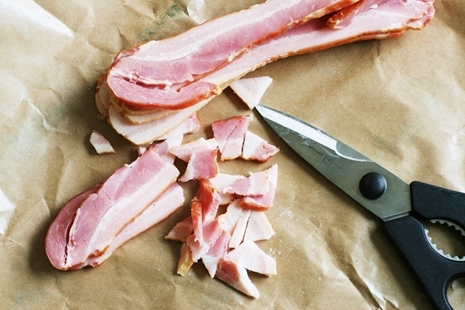 Instead of frying slices, pre-cut bacon slices into small pieces and cook them all at once. Made this today, it delicious , I didn’t use mayo instead I used a tablespoon of olive oil, and sunflower seeds. I cooked the bacon in the oven. I can’t believe that I’ve never thought to cut up the bacon BEFORE frying it. The BEST idea – takes less time to cook and I didn’t burn it! Yes, everyone loves this salad! I make this all the time! Usually with pecans and i add celery. 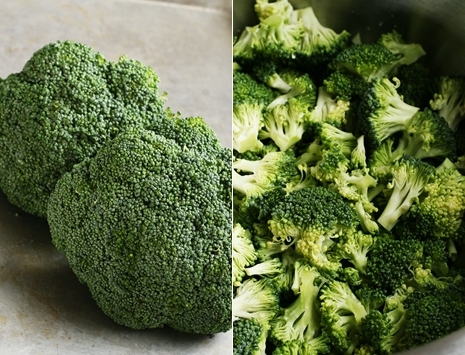 I find it’s best to make the night before, as the raw broccoli “cooks” when sitting in the dressing overnight. I have never met a person who didn’t expect to even like it not absolutely love it. It’s addicting! I made this at home and is DELICIOUS! This looks so good! And the bulk bins are my favorite. So many times when I need a recipe it’s for such a little amount of something and it’s so much cheaper buying it that way! I have been making my cole slaw dressing with sweet and low in the place of sugar and you can’t tell the difference. This salad was so good!! I made it for a potluck and came home with a empty bowl. 🙂 I think I will use a bit less pepper, but that’s just a personal preference. Thanks for the great recipe!